Ghirardelli Square, Larkin Street and Beach. Detail Ghirardelli, Anchor, and Boudin are three brands forever connected to their roots in San Francisco. Though collected here as original San Francisco food items, each has its unique story. The Boudin Bakery - and the legend of San Francisco sourdough bread - began in 1849 when Isidore Boudin invented the "mother dough," the alpha recipe still used today. The company has a mixed history of private and corporate ownership. The Boudin family owned the business until 1945, when they sold it to the company's master baker, Steven Giraudo. The Giraudo family sold the bakery to Specialty Foods of Illinois in 1993 but bought it back after nearly a decade. Anchor Steam Beer is San Francisco's beer. Founded in 1896 and rejuvenated in the 1960s when the brewery was purchased by appliance guy Fritz Maytag, the Anchor Brewing Company revived the American tradition of craft beer. For many, a tour of the brewery at 1705 Mariposa Street is equal to a beer lover's pilgrimage to Amsterdam's renowned Heineken. 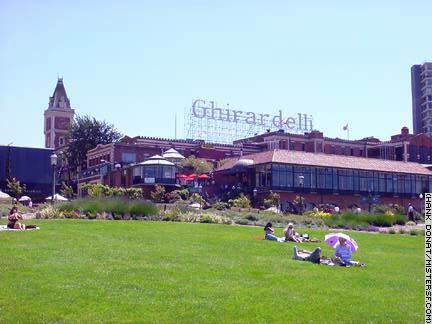 Ghirardelli Chocolate Company was founded in 1852 by an Italian immigrant, Domingo, aka Domenico, Ghirardelli. The Ghirardelli chocolate factory along Fisherman's Wharf first illuminated its famous sign in 1923. The factory was converted into a marketplace in the early 1960s and designated as a landmark shortly thereafter. Apart from this legacy, there is little that remains of Ghirardelli in San Francisco. The chocolate operation relocated to San Leandro around the time Ghirardelli Square became a market. Today, the company is owned by Sprungli Chocolate of Switzerland. A non-commercial location where a visitor can honor the Ghirardelli legacy is 415 Jackson Street, the site of Domingo's original chocolate factory.